Maharashtra Assembly on 29th November (Thursday) unanimously passed 16% Maratha Reservation Bill 2018 for Marathas under Socially and Educational Backward Category. 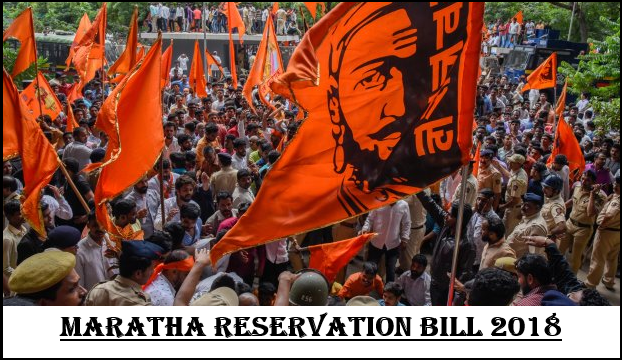 The Maratha Reservation Bill 2018 provides for Reservation of seats for admission in educational institutions Job in Government services to Marathas who have been decalred as Socially and Educationally Backward Class in Maharashtra . Pune Cantonment Board (PuneCB) invites Online Application from eligible & interested candidates for recruitment to the post of Assistant Medical Officer, Junior Engineer (Civil), Junior Engineer (Electrical) , Teachers (B.Ed) & Teachers (D.Ed) on permanent basis. 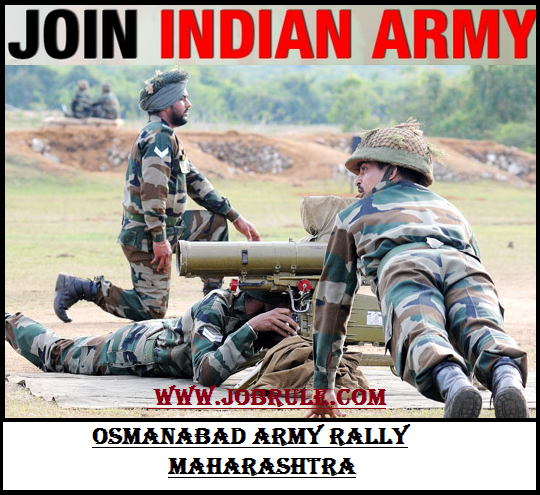 Army Recruitment Office (ARO) Pune going to conduct a direct/open (pre-Rally Online Registration Mandatory) Indian Army Soldier Recruitment Rally at Osmanabad Police Parade Ground (Maharashtra) on and between 5th April-15th April 2018 for the districts of Ahmednagar, Beed, Osmanabad, Latur & Pune of Maharashtra State to recruits thousands Indian Army Soldiers in various Trades. 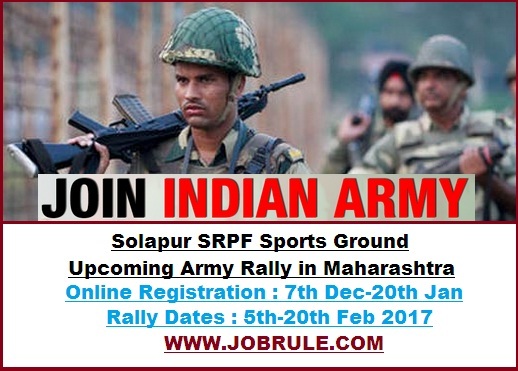 Army Recruitment Office (ARO) Kolhapur & Nagpur under HQ RTG Zone Pune (Maharashtra) going to conduct a direct/open Indian Army Soldier Recruitment Rally at Solapur SRPF Sports Ground, Soregaon, Solapur, Maharashtra on 5th-20th February 2017 (tentative dates) to recruits thousands Bhartiya Sena Samannya (Sol GD), Soldier Tradesman, Sol Technical, Sol Clerk/Store Keeper Technical etc trades. 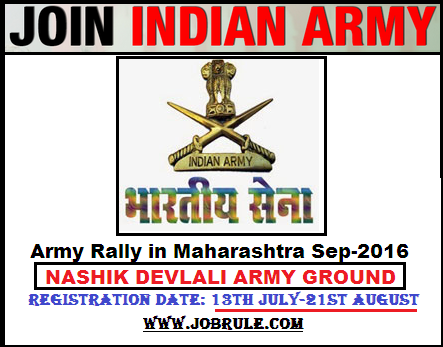 Eligible candidates from the district of Kolhapur, Ratnagiri, Sangli, Satara, Solapur, Sindhudurg ,Wardha, Washim, Yavatmal, Nagpur, Bhandara, Akola, Amravati, Chandrapur, Gadchiroli & Gondiaof Maharashtra State ,may fill up Online Registration Form from 7th December (13th Dec) 2016 to 20th January 2017 to participate at Solapur SRPF Sena Bharti Mela February 2017. 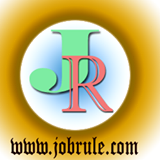 City and Industrial Development Corporation of Maharashtra (CIDCO Maharashtra) Development Officer (General)/ Assistant Development Officer (General) Recruitment written Online Examination Admit Card/ hall ticket/ call letter download link. CIDCO Admit Card Download.